Discussion in 'Dovetail Live Article Discussion' started by TrainSim-James, Dec 18, 2018. A really good interview, thanks to Ed and Dovetail Games for creating this. Both the Class 45 and Class 33 are excellent locos, which have set a high bar for future locos released for Train Sim World. It's also good to see that Dovetail Games are taking into consideration the views of developers when creating the editing tools. I also enjoyed watching the recent editor stream focusing on scenario creation, it is really helpful to see what the tools are like before the public release. Will there be further streams showing route creation and reskins for locomotives in the new year? This is exactly why the tools should have been released day one. The first time you let loose a third party developer, who seemingly had no prior experience with Unreal Engine, he produces the best locomotives for the simulator thus far. Having developers who are driven by their passion and interest as opposed to being driven by profit makes a huge difference in the quality of the product. 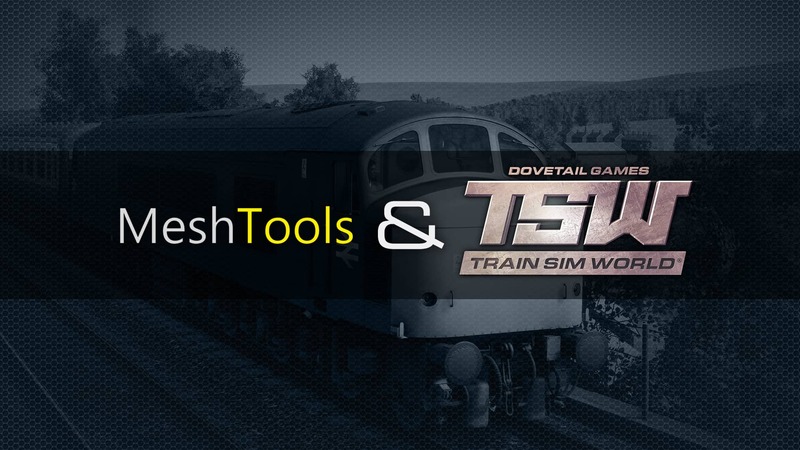 Something I do notice is that there is no mention of any issues with the TSW tools; So Ed didn't find any problems with the tools or anything that could have been better or features that could be added? I can't think of piece of software I've used that's worked perfectly out of the box, so I'm a little dubious about lack of constructive feedback featured in the article. Whilst I appreciate the article, you shouldn't be sandwiching it between two adverts, you'd be better off with just the one advert at the end rather than going for the hard sell. The idea should be that someone reads the article, are inspired by the passion and enthusiasm shown by Ed and then ask the question 'where do I get these locomotives?! ', to which you answer by providing them with the links to the products at the end of the article. Nobody wants to have to scroll back to the top of the article to find the links to the products. You also haven't provided links to the PC version of the NTP DLC or the Class 33 DLC, only links to the console preorder. The PC versions of NTP and the Class 33 are out now, and it's Christmas, promote those products!!! Enjoyed the read and always welcome more insight into the enginerding going into the simulation . Good read when it comes to those interested in locomotive development, but I'm disappointed that there wasn't anything related to route development (which arguably is the best part about the editor). Us route builders need some love!!! I’d also like to see a stream/tutorial/article/information on how to route build using the editor as I am not particularly interested in making scenarios. Though it was still nice to see. I hope once the editor is released we get a manual or guide to help us through it and cover specific tasks, rather than having to go through various YouTube videos to find what I want help with. I believe Matt did mention in the stream that he would cover route building later but I'll make sure Matt's reminded in the New Year when he's back in the office. That he did, but it's just a shame it wasn't covered much up to this point. But no worries, I'm patient. It should also be noted it would be absolutely useless asking me about the route editing tools as I haven't looked at them yet! How will the Editor be delivered to us? We will deliver the Editor to you via the Epic Games Launcher when it becomes available. Go to https://www.unrealengine.com/download and download the launcher. Create an account and you’ll see on the Modding tab there are already a host of other UE4 Editor kits for other games, ours will be added to that list when it is ready. We’ll post an update once the Editor Tools are available. and start learning about the UE4 editor upon which the TSW editor is based. There are a number of youtube training videos available both from Unreal Engine and from other people. thank you for responding thought I'd ask cause I wasn't sure if there was a release date and I hadn't just missed it. also the mod tab you have mentioned is that in unreal engine that i download and install or on the epic launcher as i don't see it on the epic launcher. also the mod tab you have mentioned is that in unreal engine that i download and install or on the epic launcher as i don't see it on the epic launcher. Probably the former. I'm not on that particular system so I can't say for certain. You need the 16.3 engine installed anyway to use the editor. Don't bother to install the later versions of the engine unless you actually need them or DTG upgrade to a later version. Rather than route building, my interest lies in scenario making, so I would appreciate seeing some information about that, please. Did you see the stream? For what it's worth, I think the Unreal engine editor looks fantastic, intuitive and I can't wait for the TSW world to explode in content, be it great or rubbish, provided by the passionate community. Thanks DTG, onwards and upwards (and a very big thanks for bringing TSW to us)! P.S Yeah, the Editor Premier show was a great presentation, nicely paced. Well done Matt! is there any release date yet for the editor, i feel like i and others have been waiting years for it to come out on beta, its killing me this wait, i', so excited for it. Also, has anyone been looking at UE4 blueprints, how to use...how to import mesh etc into the engine. The new editor won't take any prisoners I guess, and nor should it. Just be prepared for a great editor, just not easy to use! Blueprints are what you'll use to modify pretty much anything in the editor. Most common application being scenarios. UE4 natively supports .FBX file import, so it's extremely simple to import 3D models along with their respective meshes, textures, materials, etc. The editor will not take any prisoners. People will LOVE and complain that it's difficult to use, but that's par for the course. So I am practising in Blender 2.80 to make a mesh for an asset now. Do I import the textures and materials from Blender, or do that IN the UE4 editor? I guess the less you have to import into UE4 the better?